Many novice bikers have a one-track mind about what mountain biking entails. While all mountain bikes are designed to withstand the rigorous off-road terrain and constant wear and tear, there are actually numerous types of bikes made for different disciplines. Where and how you ride your bike can make all the difference. Whether you’re new to the sport or a seasoned athlete, knowing about the different types of mountain biking styles is beneficial. Choosing the right bike for your discipline will ensure that you make the most out of your ride. The most common form of mountain biking is cross country. It involves riding for extended periods of time through trails. While it doesn’t usually involve extreme obstacles like other forms of mountain biking, it does require great endurance. It also requires significant control in order to maneuver through the trail. Most cross country trails involve long periods of climbing and descending the mountain. Trails incorporate winding paths and banked turns to make climbing the mountain more efficient. However, cross country trails vary greatly, requiring bikers to make their way through open spaces filled with mud and narrow gravel paths in the same run. This will test your ability to handle the bike. The discipline gets more challenging if time trials and races are put into the mix. If you’re looking for something more action-packed, all mountain biking is the way to go. All mountain biking involves more varied terrain and challenging obstacles. Essentially, it involves riding through the mountain’s natural terrain. While trails may be present to guide bikers, they aren’t easy to maneuver by any means. All mountain biking takes advantage of the mountain’s natural features, such as drops and jumps. It’s incredibly challenging, requiring great skill, control, and fearlessness. These types of trails are unpredictable and much more adventurous than a standard cross country trail. Be prepared to focus at all times as you make daring jumps through the mountain’s landscape. 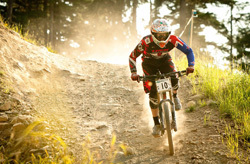 To goal of downhill riding is speed. Unlike cross country trails that involve curves and snaking paths, downhill trails are usually straight down through the mountain terrain. In fact, most riders don’t use a specific trail at all. Instead, they use their focus and control to successfully get down the mountain at the fastest speed possible. Competitions and races require bikers to achieve blazing speeds, making it a very thrilling discipline for rider and spectators. Bikers don’t ride up the mountain. They either walk up a specific trail or are taken up via a lift system. It’s one of the most extreme forms of mountain biking and requires excellent skill and control. Riders are faced with incredibly rough tracks of mountain that have huge jumps and constantly changing obstacles. Dirt jumping is just as the name implies. Instead of riding through trails on a mountain with different types of terrain, the sport is done in a dirt park. These parks consist of many different types of jumps. Ramps of varying heights are present to provide riders of all skills with a challenge. The dirt lines are often placed close together, allowing bikers to easily move from one level to another. Essentially, dirt jumping is about tricks and air. Seasoned riders face steep ramps to achieve the most air possible. The challenge lies in achieving the right speed to perform a variety of tricks before safely landing on the other side. It requires strength, control, and a knack for airborne acrobatics. This discipline is closely related to downhill mountain biking and dirt jumping. It focuses on the art of mountain biking and tricks. If you plan on taking up freeriding, you’ll be met with a variety of different types of trails and riding areas. Most often, there are no rules or guidelines to follow. Instead, riders allow their creativity and skill to take over. This type of mountain biking takes advantage of the natural terrain and special features built into the trail, such as ladders, ramps, and beams. Freeride mountain biking is a very versatile discipline. Depending on your riding style, you may go for speed to achieve high jumps or control to get through intricate trail features. 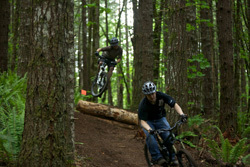 Either way, most of these trails and riding areas incorporate big drops and a number of obstacles. 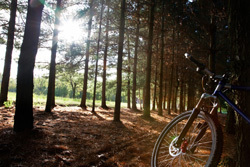 The right mountain bike can have a big effect on your ride. Bikes are designed with different activities in mind. Even the slightest difference in suspension, weight, or tire style can change the way you ride. The right type of bike for cross country mountain biking can vary based on the particular trail you’re on and your skill level. Traditionally, novice riders will start with hardtail bikes that have a single suspension system. The single suspension makes the bike easier to maneuver and allows you to make quick moves with better precision. They also allow you to move faster without exerting too much energy with pedaling. Even seasoned bikers will find a hardtail bike proficient for easier trails. However, full-suspension bikes offer better control and stability. They are especially beneficial if you’re on a trail that requires more effort on the descent. A suspension travel between 80 and 120mm will make riding through gravel and debris more comfortable while textured tires add more traction. A lightweight frame will also make moving through the trail much easier. To face the mountain’s natural terrain with confidence, you’re going to need a rugged bike designed for the task. 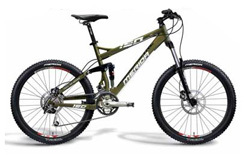 Bikes made for all mountain riding are usually full suspension for maximum control and comfort. The rear suspension has more travel than the front. The suspension travel determines how much give the bike has as it goes through the terrain. With big jumps and drops, a rear suspension travel between 130 and 170mm is needed. Tires need to be more robust as well. These bikes generally have thicker wheels that prevent punctures. A wider tire will also make getting through the mountain a breeze. Additional features, such as guide chains and a tilted head will provide quick and precise control. Since speed and control are what makes a downhill ride successful, these bikes are uniquely designed and easier to distinguish. They have a slack design that makes the bike more aerodynamic. They tend to be longer and lower to the ground. A 65-degree head angle adds more control and stability. 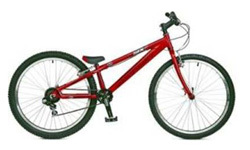 Downhill bikes also have high suspension travel of up to 220mm. Metal springs and rear shocks ensure that you stay comfortable and retain control of the bike even on the biggest drop. 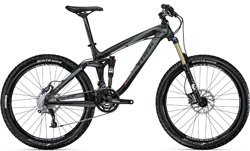 They are also much heftier than the standard mountain bike, as they are put through a lot of wear and tear. However, this makes the bike difficult to ride uphill. There also have fewer gears to take up space and allow you to clear hurdles easily. Due to the nature of dirt jumping, bikes tend to be simple in design. However, some bikes offer more features that can be useful based on your skill level. Experienced riders often use simple bikes that allow them to perform aerial tricks without the hindrance of added weight and numerous features. With speed and air being the main goal, bikes are light in weight and have a sloping design that helps with building speed. A high front suspension is common among these bikes to absorb the shock of a landing after an epic jump. Rear suspension is also a good idea, though most bikes offer only a small suspension travel. Most bikes also use a single gear and disc break system for simplicity. Freeride bikes are made to be used in a variety of different applications. Because the discipline focuses mainly on tricks and style, bikes are pretty simple. They are similar in design to bikes made for dirt jumping. They generally have full suspension systems with at least 170mm of suspension travel to absorb the shock of a drop. 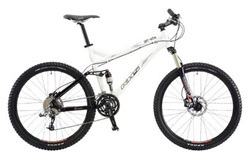 While they are also mainly made for riding downhill, they do perform better ascending a trail than downhill bikes. To make maneuvering simpler, these bikes have very light frames. This allows you to go through intricate features of the trail or riding area. They are an agile type of mountain bike that gives you more control and stability, regardless of what trick you are doing.